Today we had a very interesting adventure discovering the city of Montebello. The highlight of the trip was visiting Broguiere's Dairy and picking up some fresh eggnog and chocolate milk in glass bottles! For pictures, click here. Today we drove about a third of the way to Phoenix, AZ to visit the General Patton Memorial Museum located in the Mojave Desert. For pictures, click here. We had some excitement here last night and this morning following the massacre yesterday in San Bernardino. Apparently the two suspects lived just two blocks away from us and that's where the FBI is conducting its investigation this morning. 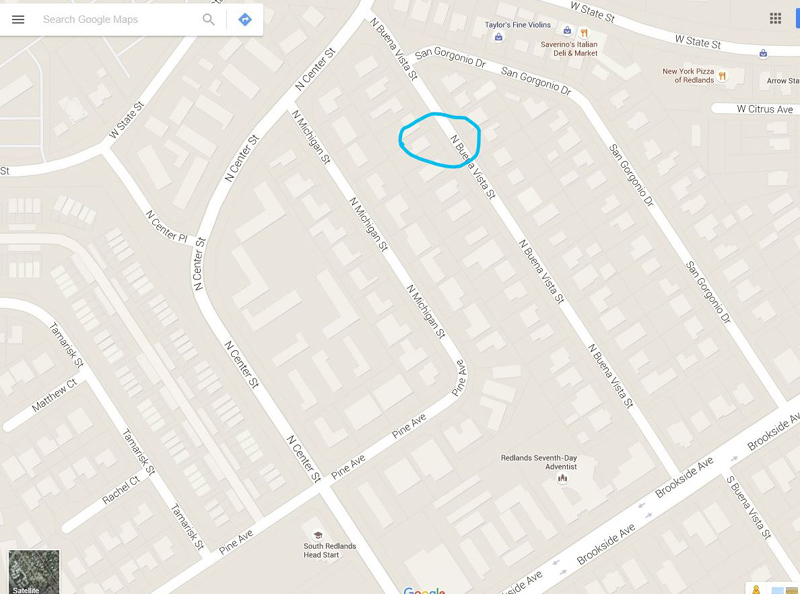 The map below shows where the apartment is at Center and Pine, which is on my route for my morning run. I go south on Buena Vista, west on Brookside, north on Center and then back to Buena Vista. I usually wear black sweats for my run, but I wore a white tee shirt today, so I wouldn't look suspicious. The police have barricaded Center Street at Brookside on the south and Center Street and N. Center Place on the north. All of the television crews have their field broadcast vehicles parked on Center Place, as you can see from this photo taken from our back screen porch. The white antennas are visible on three vehicles and all of this police activity is obviously very close to where we live. Today we went to see the Dominguez Rancho Adobe Museum in Rancho Dominguez, CA. 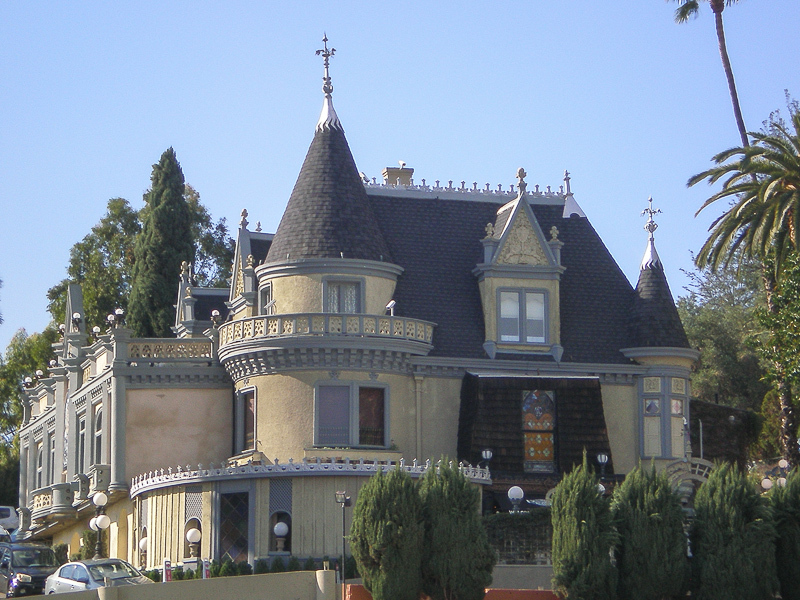 It's a beautiful building dating back to the first Spanish Land Grant in California. For pictures, click here. "Red, with its brilliant hue and broad cultural history, has inspired artists' imaginations and seduced viewers for millennia. Artists and dyers for centuries strived to find the color source to rival the best reds of nature, and to express the spirit, symbolism and sustenance of life. Their quest ended in the Aztec marketplace of 16th-century Mexico, where Spanish explorers encountered the American cochineal bug. 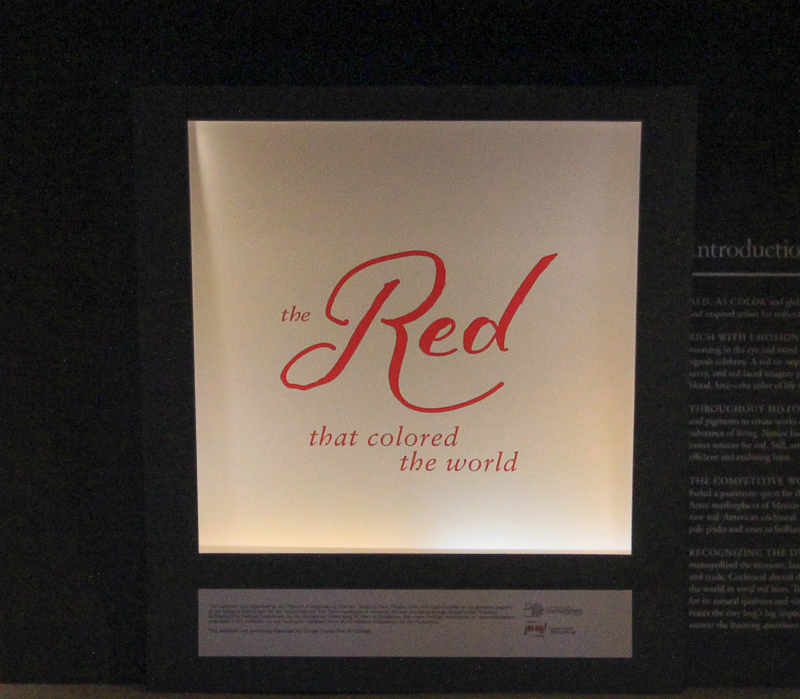 The Red that Colored the World translates the cochineal story into three dimensions, following the precious bug juice and its use in art from Mexico to Europe to the U.S. and beyond." Unfortunately no photography was allowed for this very large exhibit that had paintings, sculpture, textiles, clothing and many variations of blankets and rugs. We spent Thanksgiving day at the Joshua Tree National Park and took in all of its beauty. For pictures, click here. Today we were in Orange County to see the Helena Modjeska House and Gardens. It is a National Historic Landmark. For pictures, click here. Today we had a short drive over to the city of Colton to see their Colton Area Museum. 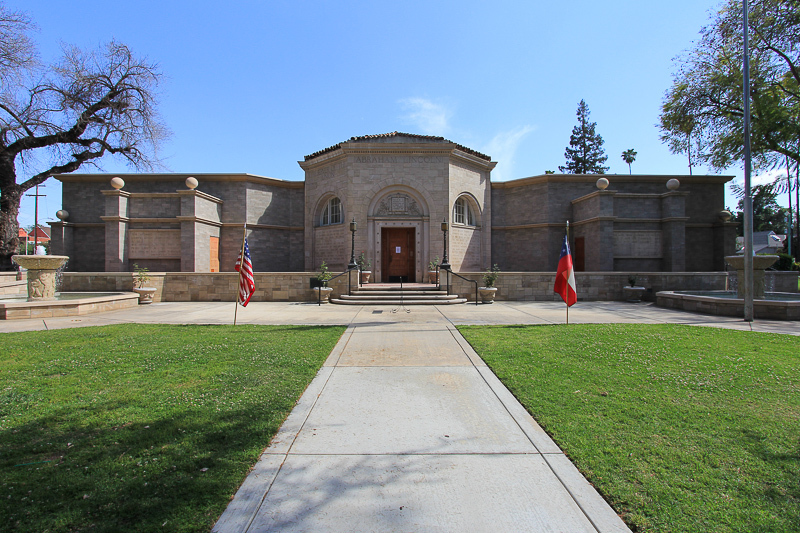 Originally it was the Colton Public Library, built from funds provided by Andrew Carnegie. For pictures, click here. Today we headed east to Banning to see the Malki Museum located within the Morongo Reservation. While the museum is small, the staff is great and the artifacts are beautiful. For pictures, click here. Today we were in Palm Springs at the Village Green Heritage Center to see a few museums. For pictures, click here. Today the Los Angeles Conservancy was offering tours of the former Hughes Aircraft Company's sprawling complex in Playa Vista, CA. This is where Hughes built the "Spruce Goose." For pictures, click here. Today we drove over to San Pedro to visit the Cabrillo Marine Aquarium, a wonderful place located in a beautiful setting. For pictures, click here. We had a real treat today visiting the Heritage Square Museum in the Arroyo Seco section of Los Angeles. There are nine lovely buildings dating to the final years of the nineteenth century. For pictures, click here. There's a "sub-mission" here in Redlands, which was actually a ranch outpost of the Mission San Gabriel Arc�ngel. When we first arrived in 2009 we had walked through it briefly, but today we decided to give it the full tour that it deserves. It's a lovely setting. For pictures, click here. Today we drove north in to the high desert to see the Animal Acres Farm Sanctuary in Acton, CA. It was a wonderful adventure, for pictures, click here. After watching a Huell Howser show about Amir's Garden in Griffith Park, going there has been on our list of things to do for quite some time. Well today we finally made it and it was worth the wait. For pictures, click here. 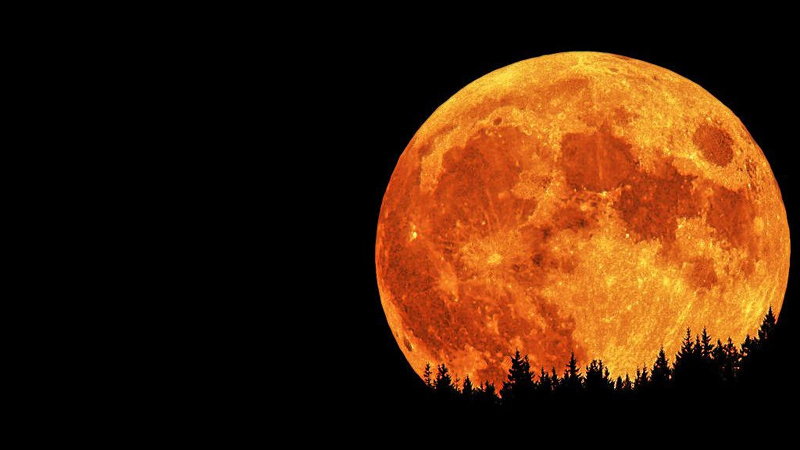 I didn't try photographing last night's Supermoon eclipse since I knew there would be a lot of great pictures available on the Internet. This picture was available through www.pc-tablet.co.in without any credit for the actual photographer. It's beautiful! We headed south to San Diego today to see our tenth Mission, the Mission Basilica San Diego de Alcal�. They're all beautiful and this one is special because it was the first Mission in California. For pictures, click here. Today we drove to the historic Highland Park district of Los Angeles to tour the Lummis House, which was built at the end of the nineteenth century. For pictures, click here. We celebrated Mary's birthday today (she would have been 103 years old today), our cat Rudy died today in 2001 (right after 9/11! Good grief!) and the last weekend of summer in 2015. Our celebration was with two delicious Maine lobsters for lunch washed down with an equally fantastic 2006 bottle of Orvieto wine, underneath the pergola by the pool. Life is good! We celebrated Judy's birthday today by going to the Castaway Restaurant for brunch. We had what we always have there ..... everything! It was fantastic and now it's time for our naps. Today we were in Hollywood after finally get enough nerve to visit the Museum of Death. The museum was founded in 1995 after its founders realized the void in death education in this country and decided to make death their life's work. This stop had been on our "to do list" for quite awhile, but the timing was never quite right to explore its collection. 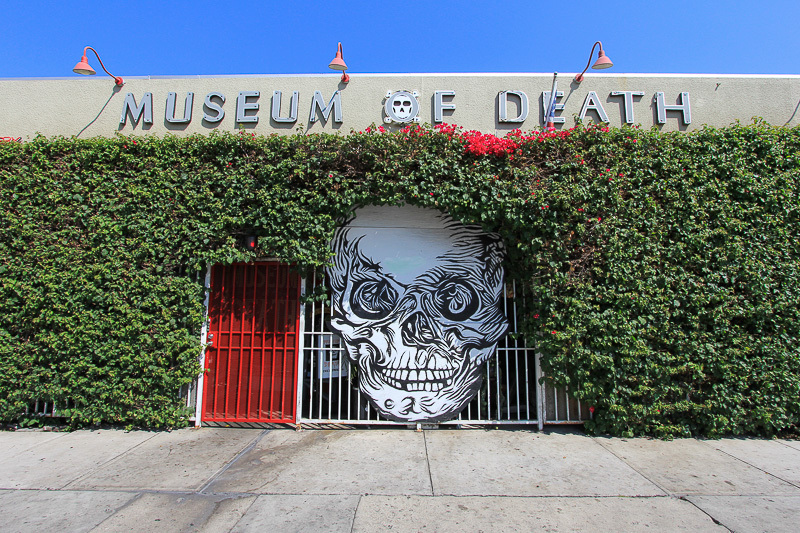 However, after visiting the Bembridge House, whose owner was strangled, and the John Rains House, which is supposedly haunted due to multiple murders, the Museum of Death seemed to complete our death and murder trilogy. No photography was allowed inside, which is probably just as well, since there was an overabundance of grizzly crime scene photos. We were back in Long Beach today for a tour of a beautiful Queen Anne Classic Victorian home known as the Bembridge House. For pictures, click here. Although unplanned, we had a "spur of the moment" adventure today, taking a tour of the John Rains House in Rancho Cucamonga. For pictures, click here. We drove south to Encinitas today to visit the San Diego Botanic Garden, and we were very impressed. We liked it even better than the gardens at the Huntington Library. For pictures, click here. We went to Newport Beach today to see an exhibit at the Orange County Museum of Art. When we stopped for lunch, lo and behold our nephew Brandon Haas was working at this restaurant on the wait staff. What a surprise for all of us! For pictures, click here. Today it was all about trains and Walt Disney. We went to Griffith Park in Los Angeles to visit the Walt Disney Barn and also see the Los Angeles Live Steamers Railroad Museum, of which Walt was a founding member. We had a great time. For pictures, click here. It's a hot day here in the Inland Empire but we managed to stay cool touring the air-conditioned Maloof House in Alta Loma. For pictures, click here. Today we had one of our best adventures yet here in Southern California. We toured the Adamson house in Malibu and enjoyed a great lunch on the Malibu Pier. For pictures, click here. We were in Santa Ana today to take in a special sale at the Bowers Museum and also to tour the Old Orange County Courthouse. What a beautiful building! For pictures, click here. Today we drove to La Ca�ada Flintridge to see the Lanterman House, which was originally built in 1915 of reinforced concrete. It is beautifully preserved and the tour was great. For pictures, click here. Today we went to the San Bernardino Public Library for the first time because of a free event scheduled for today called "Ben Hale and his Native American Tribal Dance & Culture Program." Hale is a member of the Navajo tribe from Arizona and he demonstrated North American Tribal Dances giving a cultural context to the music and he was dressed in brilliant, authentic regalia. 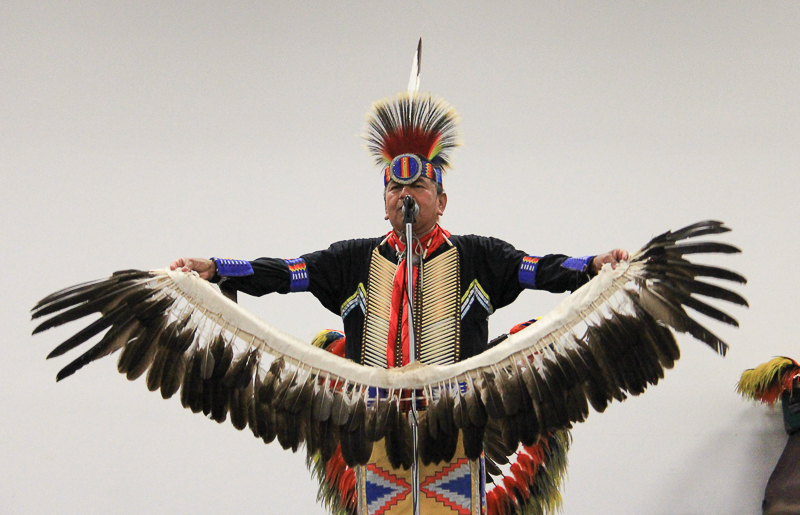 He sang three Native American songs and danced four traditional dances. 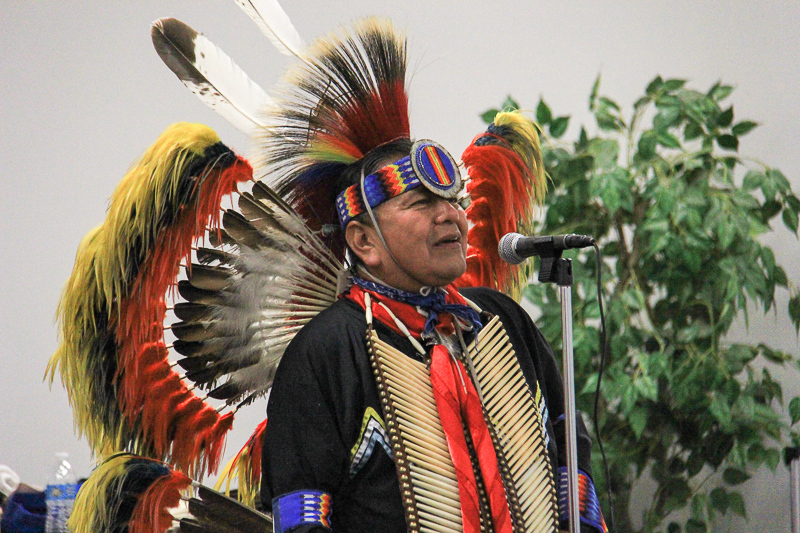 In between these, he explained the background and history of each dance and song and he also related many personal stories about his growing up a Native American in the United States of America, which was and is a foreign land to him. His stories were both interesting and enlightening. We decided to cool off, so we headed for the beach today, specifically San Clemente to visit the Surfing Heritage and Culture Center. It was a beautiful day and we loved the community. For pictures of the museum, click here. We've heard about the botanic gardens on the campus of the University of California in Riverside for quite a few years, but hadn't gone there until today. It's very large and loaded with many different species of plants. Since the school uses it as an educational facility, all of the plants are well labeled, which is very helpful. For pictures, click here. We've read a lot of good things about the Bowers Museum's latest exhibit, "The 1968 Exhibit." So today we drove down to Santa Ana to check it out. The multiple organizers did a very impressive job of highlighting the events of this tumultuous year. For pictures, click here. Today we drove south to Carlsbad to visit the Leo Carrillo Ranch Historic Park. This home was one of our favorites of the many we've seen here in SoCal. For pictures, click here. We headed to Hollywood Hills today to visit the Forest Lawn Cemetery and found out that they are a little particular about picture taking there. However, we stumbled onto the Lotus Festival in Echo Park that made up for our disappointment with Forest Lawn. For pictures, click here. We had a great tour today of the Hollyhock House in the East Hollywood neighborhood of Los Angeles. This house was designed by Frank Lloyd Wright and built in 1919-1921. For pictures, click here. We received another Native American treasure today from Beverly. 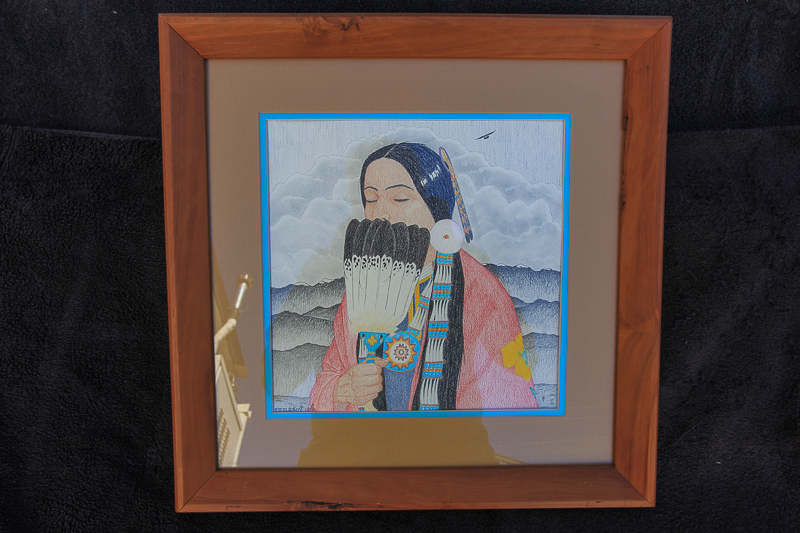 This drawing is colored pencil on paper and was another piece of art given to Bev from Joe (who had lived on a reservation). 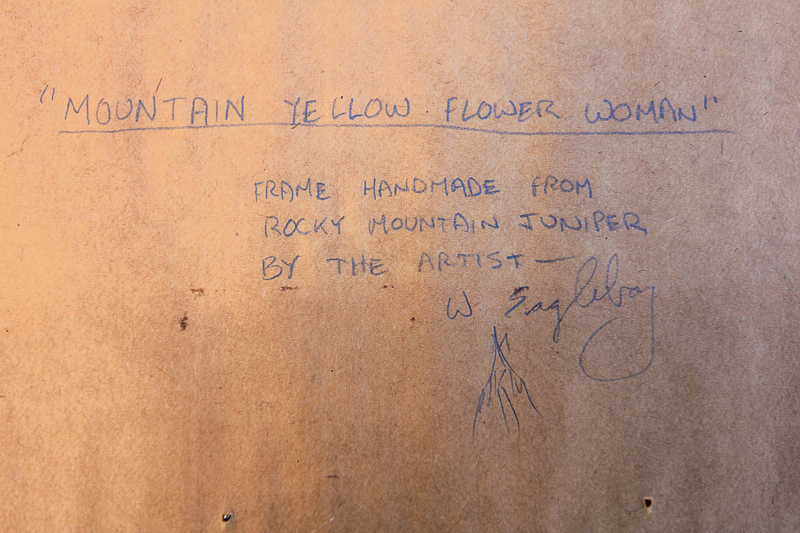 It is titled "Mountain Yellow Flower Woman" and is signed W. Eagleboy, 1981. The frame is made of Rocky Mountain juniper and was hand-made by the artist. Bev thinks that the portrait is of Eagleboy's wife. This could be the work of Wayne Eagleboy, a Native American artist of that period. Before today, most of the smoke from the Lake Fire in the San Bernardino National Forest was drifting east. Now it has settled in and around Mt. San Gorgonio in all directions. We have a new addition to our home, thanks to Bev, Judy's sister. Bev had known a man named Joe who had lived on an Indian reservation at one point in his life. 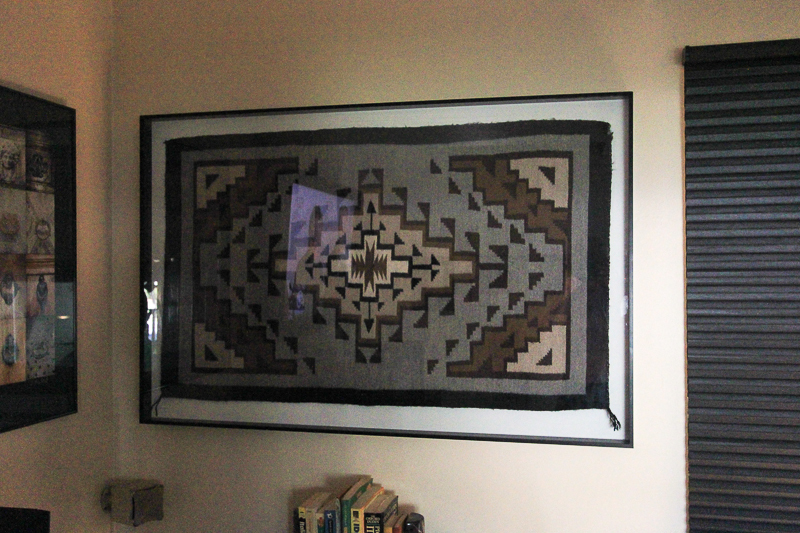 He had accumulated several Indian artifacts while there, including a Two Grey Hills Navajo rug. The rug is roughly 30-40 years old and it was left to Bev after Joe died. She recently gave it to us and I was able to mount it successfully. It measures 47" by 28.5" and it is indistinguishable when seen from front or back. The market value of these rugs varies widely depending on age, quality, condition, etc. This one is slightly damaged as a result of some dog chewing in the upper corners, but overall it remains striking. We are both proud to own it. We drove over to Westwood today to visit the UCLA campus. Our stops there included the UCLA Meteorite Collection and the Fowler Museum. For pictures, click here. We were in Wilmington, CA today to visit the Banning Museum, a 23 room Greek Revival gem. For pictures, click here. Our big trip this year was to visit New Mexico, since we've never explored it before. We had three days in Taos and Santa Fe and we had a great time. For pictures, click here. Today we went to the Bowers Museum in Santa Ana to see their new exhibit called "Adams, Curtis and Weston: Photographers of the American West." For pictures, click here. Today I finished reading a biography of the "Desert Fox, " German Field Marshall Erwin Rommel. This was my 250th biography read since I began reading biographies in February 2010. I previously had consumed about 50 books a year, but as I began to pass on the lighter reads and started to lean on the headier books, I have somewhat slowed down my pace. However, that's fine with me. I'm into the R's and still forging ahead. Every we drive to Palm Springs, we always pass this place that rents dune buggies and ATVs. Well, after seeing it at least a dozen times, we decided to take the plunge and that was today's adventure. What a blast! For pictures, click here. While reading the paper this morning, I saw that the original McDonald's Restaurant in San Bernardino was celebrating its 75th anniversary today. The original building is long gone but there's a McDonald's Museum now located on the original site. We headed over there and had a great adventure. For pictures, click here. Today's adventure was to visit the Pasadena Museum of California Art. The museum showcases art and design that originates from California. 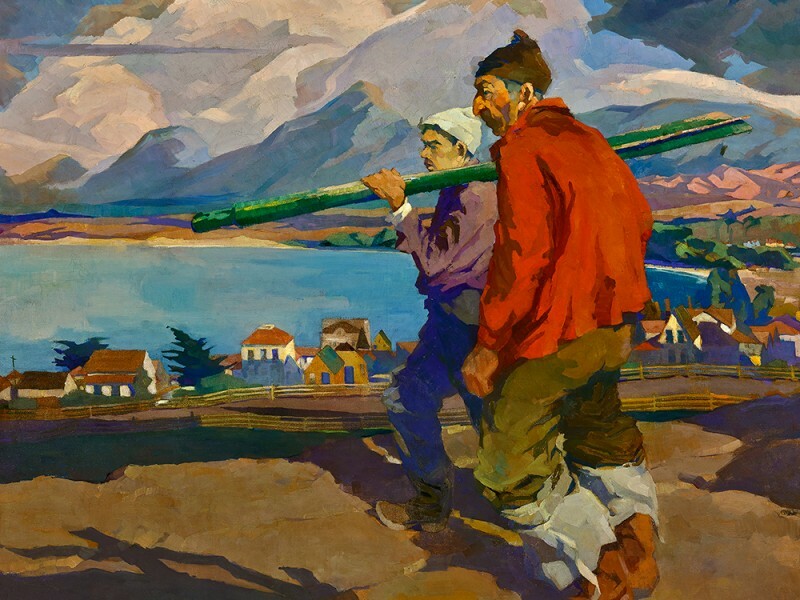 The main exhibit that we wanted to see was "Armin Hansen: The Artful Voyage." Hansen (1886-1957) was renowned for his paintings of fisher folk and the sea. 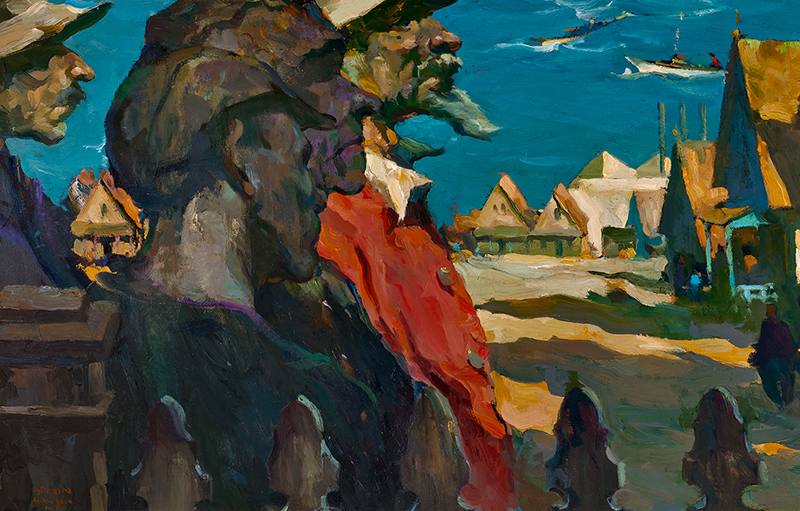 While his style is often described as impressionist, Hansen rejected Impressionism�s gentility by exercising a bolder palette and more rugged strokes. The exhibit includes close to 100 of his works, but photography wasn't allowed. Below are copies of two of his paintings. We had paninis for lunch at Porta Via and followed that up with a delicious butterscotch sundae at the Fair Oaks Pharmacy. 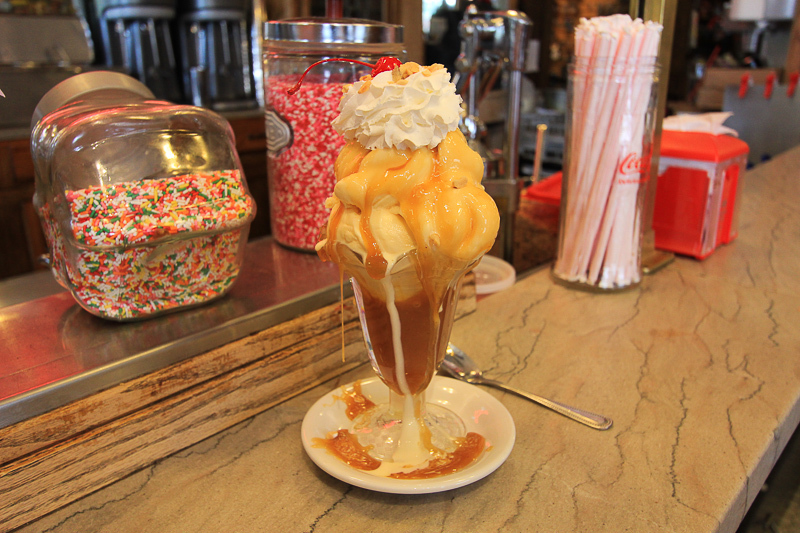 It had been decades since we last enjoyed this soda fountain treat. 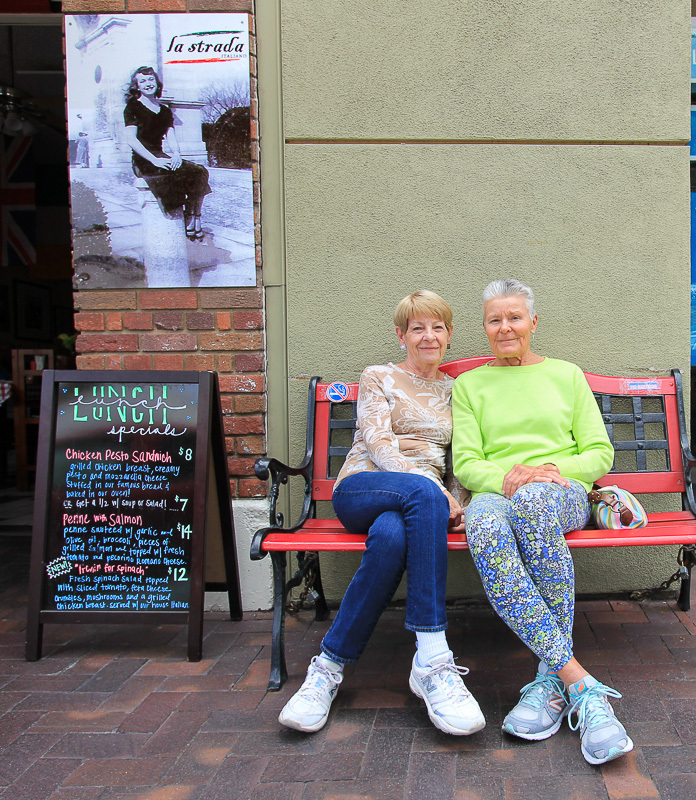 My sister Nancy flew out from South Carolina to visit us this week and she wanted to see the Naples neighborhood of Long Beach. Although it was overcast, we had a nice time walking around and then we enjoyed a nice lunch at La Strada. Nance had their Farfalle Primavera, a bowtie pasta with mixed vegetables in a light pesto sauce. Judy had their Butternut Squash Ravioli, a beautiful squash-stuffed ravioli in a browned-butter sage sauce and I had their La Strada Eggplant Parmesan, which is breaded eggplant layered with fresh tomato sauce and Mozzarella cheese that is oven baked. Today's adventure was mainly an "eating" adventure, but we also got another site in besides the restaurant. 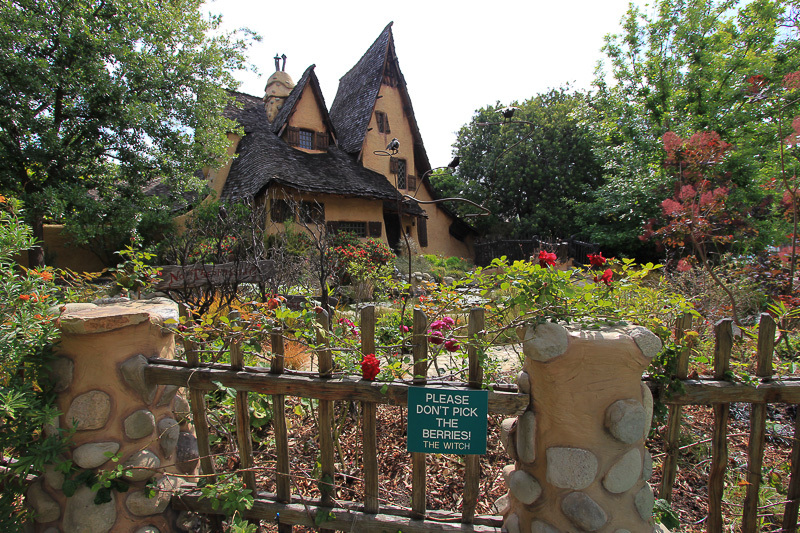 Our first stop was the Spadena House in Beverly Hills, also known as the "Witch's House." It's a storybook house that was originally built in 1921 to serve as the offices and dressing rooms for Irvin Willat's film studio in Culver City, and was moved to its present location in 1934. The converted private home, with its pointy, lopsided roof, tiny windows and stucco with a distressed paint job were then surrounded by an intentionally overgrown English-style garden and a moat-like pond. It is charming. After the Witch's House we headed east to the Echo Park neighborhood of Los Angeles to have lunch at the Taix French Restaurant. 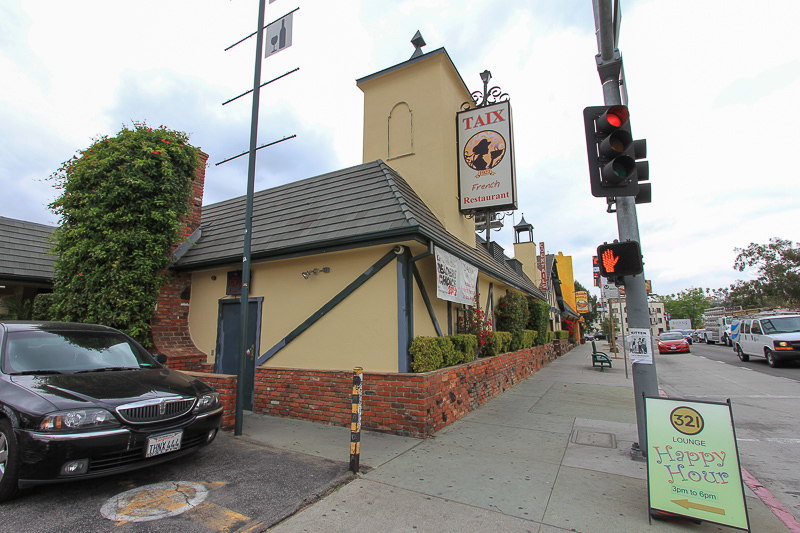 In 1927, Marius Taix, Jr. opened the Taix French Restaurant within his father's hotel in the French Quarter of Los Angeles. The present location opened in 1962 and continues to be a family affair. 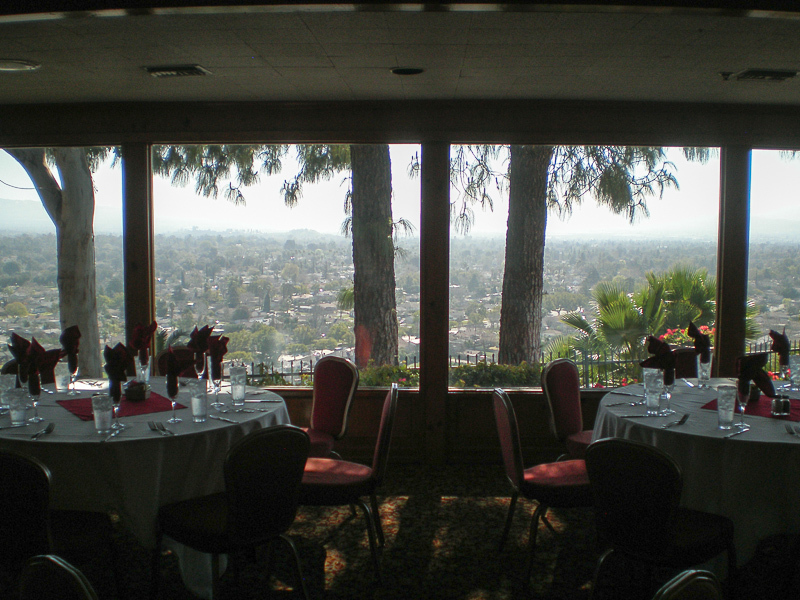 Family style service has given way to private booths, but the restaurant remains faithful to the famed tureen of soup, fresh French bread, and abundant portions of French country cuisine. We both ordered the same selections today, starting off with their Baked French Onion Soup. It was wonderful! Then we each had something that we haven't had in quite a long time, Steak Frites au Poivre, which is a grilled skirt steak with black peppercorn cream. It also was heavenly. For dessert, we split a Mousse au Chocolat Noir, which was light and flavorful. It was a pricey lunch, but worth every penny. Today we learned all about windmills in Palm Springs thanks to a two-hour tour. For pictures, click here. 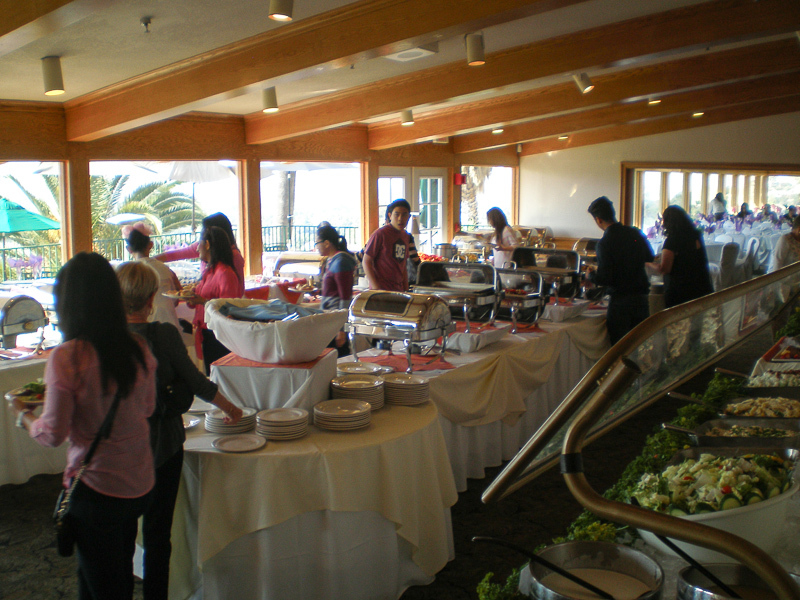 It's been awhile since we had Sunday brunch at the Castaway in San Bernardino, so we went there today for a pig out. You don't realize just how much you've eaten until you stop. Everything was very good and very plentiful. Today we were back in Pasadena to see the latest exhibit at the Norton Simon Museum, "T�te-�-t�te: Three Masterpieces from the Mus�e d�Orsay." For pictures, click here. 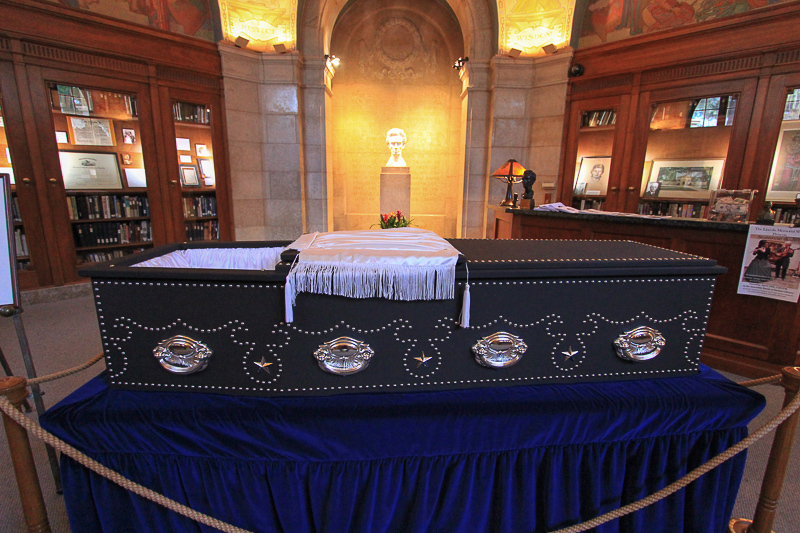 The Lincoln Memorial Shrine, right here in Redlands, has a replica of Abraham Lincoln's coffin on display for the next three weeks. Apparently five copies of the coffin have been made. 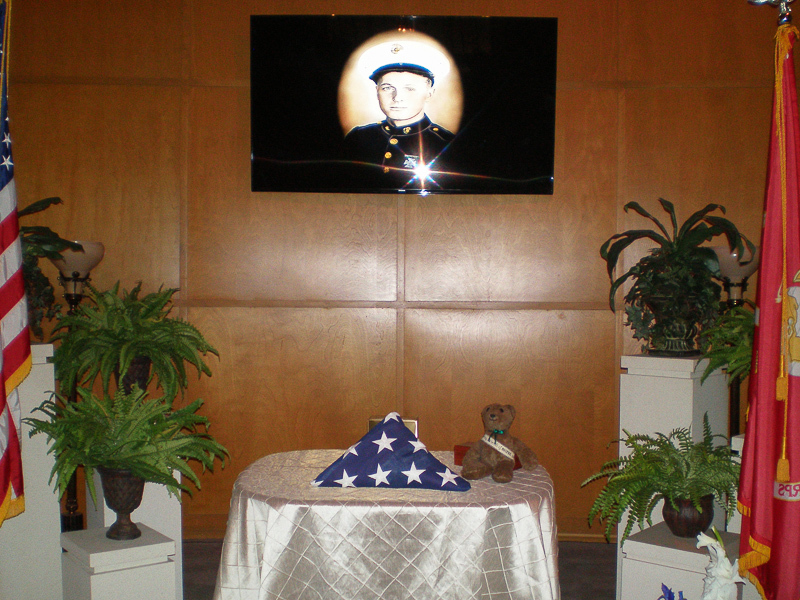 Four of the five coffins travel to funeral homes across the nation for display. 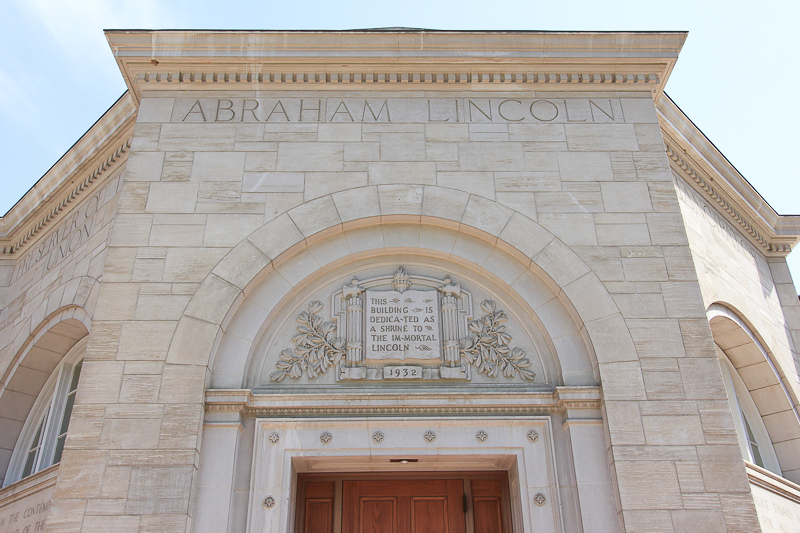 The fifth is part of the permanent collections at the Abraham Lincoln Presidential Library and Museum in Springfield, IL. We found another "oasis" in the city of Long Beach called "Rancho Los Cerritos." It has a rich history and is a beautiful site. For pictures, click here. Today we saw "Lucky" Baldwin's honeymoon cottage within the Los Angeles County Arboretum and Botanic Garden in Arcadia, CA. What a beautiful Victorian building it is. For pictures, click here. We had a wonderful tour today of the City Hall in Los Angeles, given by the Los Angeles Conservancy. To see a lot of pictures, click here. We were in Indio today to visit the Coachella Valley History Museum, which was beautifully maintained. For pictures, click here. Whenever we go on our adventures, we never know how they're going to turn out. Obviously some are better than others. However, yesterday we hit a home run by seeing the Rancho Los Alamitos in Long Beach. It is a true treasure. For pictures, click here. Our adventure today was to visit the Campo de Cahuenga in Studio City, the site that marks the birthplace of American California. For pictures, click here. Today we headed to the high desert to see a couple of museums in Apple Valley and Victorville. In addition, we had lunch at the famous Emma Jean's Holland Burger Cafe on historic Route 66. For pictures, click here. Today we got to act like a couple of kids by going on train rides at the Orange Empire Railway Museum in Perris, CA. It was a lot of fun! For pictures, click here. We took a short trip today over by the March Air Reserve Base to see the March Field Air Museum. We were pleasantly surprised and had a great time there. For pictures, click here. Our friends Olga and Mark Farrell were visiting from the East Coast and we met them in San Juan Capistrano for lunch and a tour of the Mission. We all had a great time. For pictures, click here. 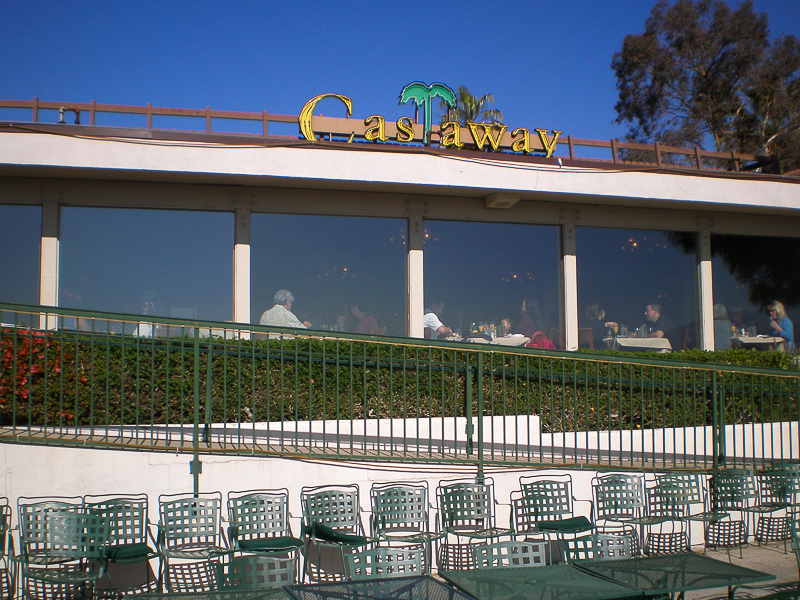 We've heard about the Castaway Restaurant in San Bernardino, but we never went there until today. Their brunch is fantastic and the view is awesome. 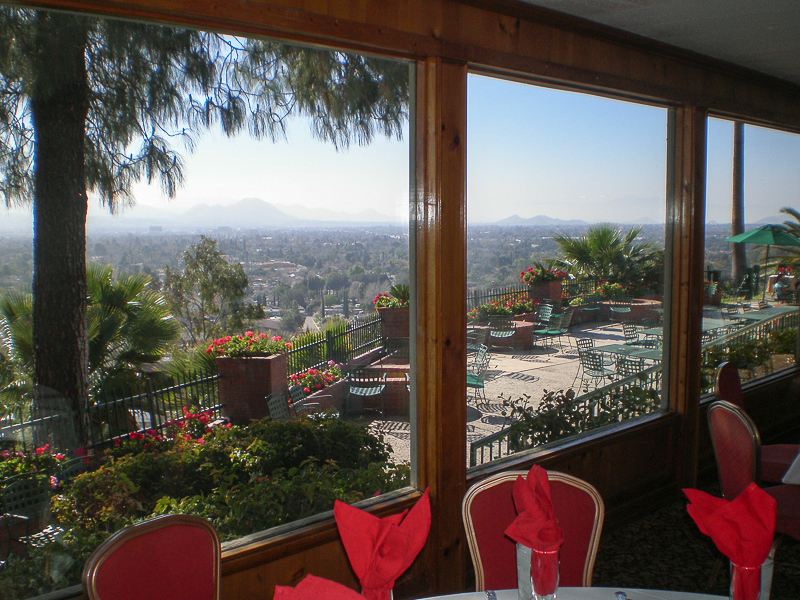 It's another hidden gem in the Inland Empire. For a few years now I've been aware that this web site hasn't "played well" with mobile devices, tablets, smart phones, etc. However, I didn't know how to fix the problem until the folks at Google pointed me in the right direction. I had to hand edit the HTML code of nearly 160 pages in order that these pages displayed well no matter which browser was being used on multiple device types. I thought I had the problem solved until my nephew, Bryan Henderson Haas, did the field testing. Thanks to him, I've tweaked the code again and finally fixed the problem. Of course, Bryan was the most logical person to ask since he owns all of the digital toys. Thanks Bryan! Judy returned from Nevada City today after attending the memorial service for Bev's husband and sweetheart, Charlie, yesterday. They had torrential rain there but about 70 people came to pay their respects. It's a beautifully warm winter day here in Redlands so we took a hike in the Box Springs Mountain Reserve. For pictures, click here. Today we had a very interesting adventure in Hollywood. 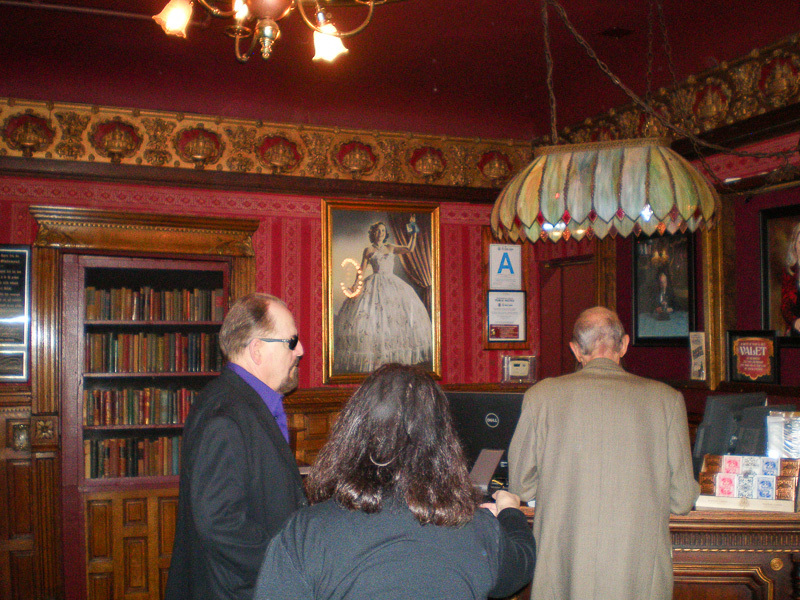 We were lucky to receive an invitation to the Magic Castle and we went there for brunch and some magic shows. 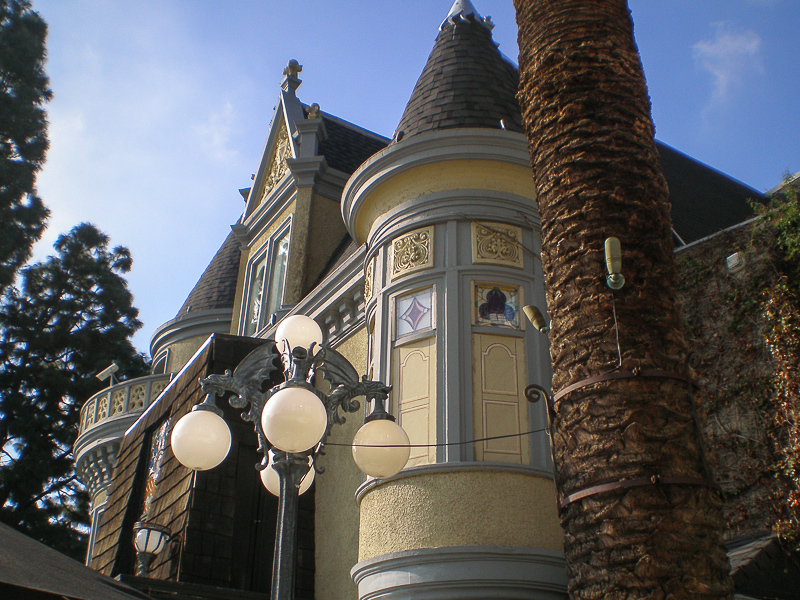 The Magic Castle is the private clubhouse for the Academy of Magical Arts, Inc, a very special organization devoted to the advancement of the ancient art of magic. No photography is allowed inside, which is a shame since it is such a fascinating place. The buffet brunch was very good and we had the good fortune to meet one of the clubs members, Lee Delano. Lee not only gave us a tour of the castle but, he performed magic for us as well. Lee's film and television credits are numerous and he related a lot of great stories about Milton Berle, Sid Caesar, Mel Brooks, Steve McQueen, and many others. We had a wonderful time with him and his wife Carol. 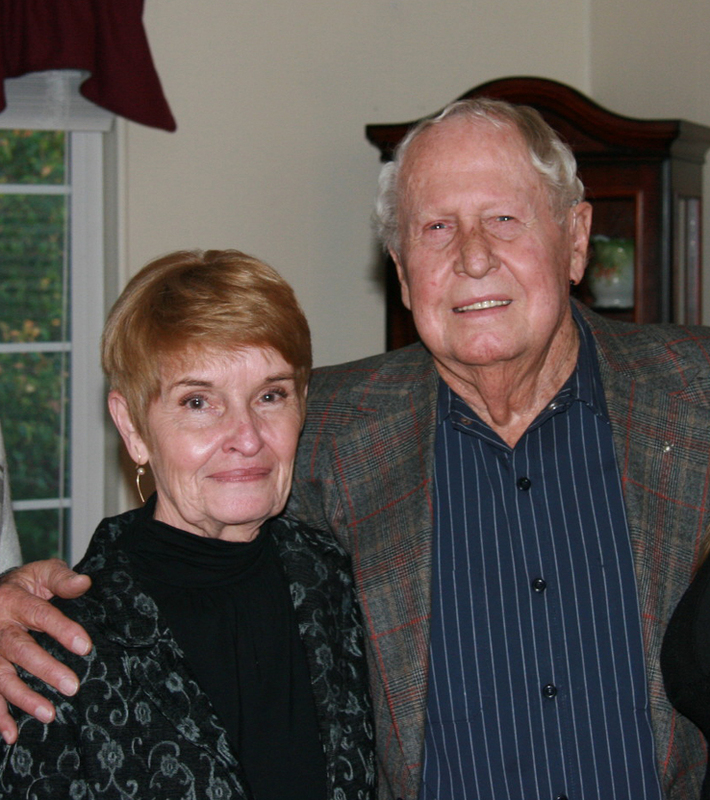 This picture unfortunately shows Lee's back and his second cousin Constance and her husband Jesse. Lee promised that he would send me one of his special DVDs. I can't wait! Today we were back in Pasadena for a guided tour of the highlights of the Norton Simon Museum. Their collection of Impressionists and Post-Impressionists is renowned internationally. For pictures, click here. I've recently decided to change my web page format for new pages, eliminating the left margin and increasing the picture size from 800 to 1,000 pixels. 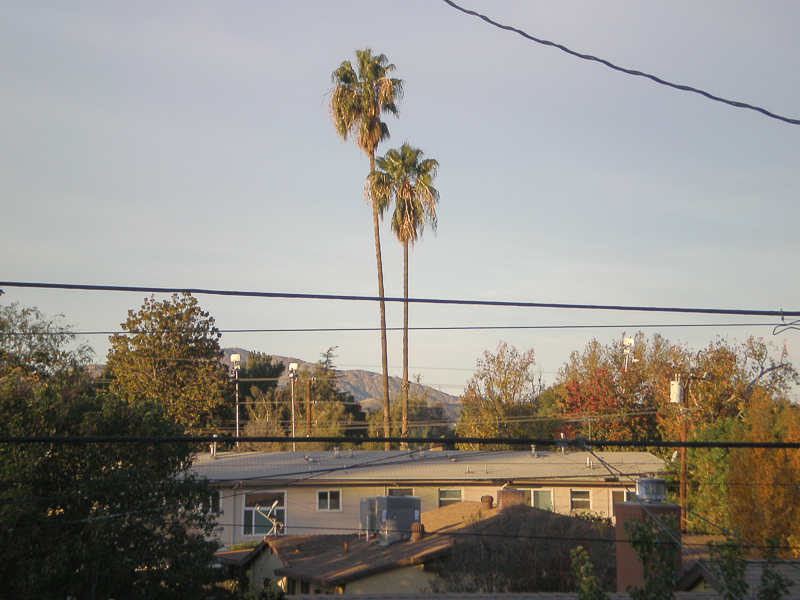 I shot some pictures of a Redlands sunrise this morning and you can check out the new layout here. Yesterday we lost our brother-in-law Charlie Harrison. Charlie was born on March 21, 1921 and had a long military career in addition to being a POW. Here's a picture of Charlie and Bev on their wedding day back on November 21, 2007. Today we were in Pasadena to visit the Pasadena Museum of History. The Fenyes Mansion on their property is spectacular! For pictures, click here. We drove to San Pedro today to see two sites. The first one was the Fort MacArthur Museum, which was a coastal defense fortification built in 1917. The second stop was the Point Fermin Lighthouse Museum, which was simply charming. For pictures of each site, click the hyperlinks above. Well, it's a new year and time for a new adventure. Today we went to Palm Springs to visit the Palm Springs Air Museum. It has one of the world's largest collections of flying World War II warplanes, many of which were built in Southern California. For pictures, click here.